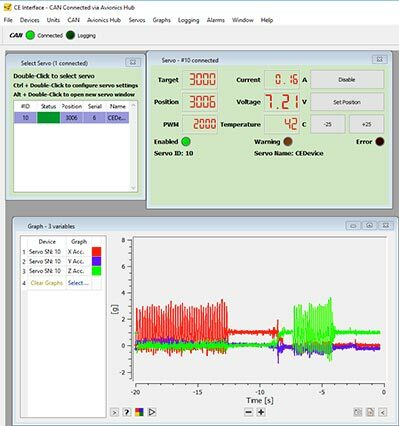 The cEQUIP software is a powerful engineering and diagnostic tool that links all Currawong systems and allows for their configuration and real-time graphing and logging. The software connects to all products in the Currawong CAN avionics architecture, as well as supporting devices utilising RS232 and Ethernet. cEQUIP parses and displays all telemetry available on the CAN bus, giving instant and highly visible feedback of critical data for each device, coupled with a fully customisable graphing interface. The software is supplied free of charge to Currawong’s customers.